AllisonBerryman General Discussion -> Should Beta Testers be allowed to keep their Beta characters into Launch? Hello everyone! Characters created in the Game Testing Program (any testing group) will not be carried into the live game. Characters created during Early Game Access (which you get for redeeming your Pre-Order Code on SWTOR.com) will persist when we launch. Hope this dispels any “rumor” about characters in testing carrying over to the live game. I think most everyone assume this would be the case. I don’t know of many betas if any who have allowed testers to carry over their testing character into the live game, upon release. AllisonBerryman General Discussion -> Does Darkside change Appearance? It’s True! Hey everyone! We’re glad to see that you’re all so enthusiastic about dark side corruption, but wanted to clarify just a little bit about it. At this time, dark side corruption is an option that you’re able to toggle on and off yourself. We’re excited to have the feature in the game, but currently the plan is to allow you to use it if you want to. I talk about my feelings on this subject in Georg’s Goodies, and yes, the “fanboy” go on a bit on a rant. Yep, this also contradicts what Zoeller was saying on class philosophy design. I wonder who was wrong, or if something has changed or was misinterpreted. As I said in another thread on the topic, I got myself mixed up – a combination of my limited experience as a tank (generally) and my time spent playing a Sith Assassin specc’ed to be an off-tank. Again, apologies for the confusion… don’t blame Ed for the question, blame my lack of sleep. And lack of tanking. I guess I should level a tank to 50 in live now to make up for it. Okay folks, Stephen made a mistake. It is not a huge deal. I think because of what he said and Georg’s replies we actually learned a bit more on what is to be expected in being a tank etc. The game is meant to have really 16 classes and you need to spec according to the role of the class. Now this is not saying you cannot make a hybrid work, but it might not be very effective going multiple paths with skills points, instead of sticking to primarily one tree. All tank specs in the game are designed to function as a main tank. There are no ‘off tanks’ by design in the game, that would involve players intentionally choosing such a role by speccing hybrid. At this time, we do plan on having “racial” abilities, but they will be cosmetic in nature. Think of them as “social” abilities or actions that your character is able to do based on their species. So, active “racial” abilities are planned, but they won’t affect your combat gameplay in any way. We’ll elaborate more in the future. Adding fun abilities like new dance moves, or special emotes, maybe even “Crafting” preferences to some races that would let you do certain crafts a little faster (not better, just a little faster), are fine. Adding performance enhancement is opening a can of worms. Even worse is adding combat-related class specific abilities. Keep race selection based on aesthetics, not performance. My team put them in, so yeah, it’s true. GeorgZoeller General Discussion -> Does Darkside change Appearance? It’s True! Like ‘Hide head slot’ or ‘Unify colors to chestpiece,’ this is a game option, on by default, which can be toggled on a per character basis. It appears Dark side “corruption” can be toggled on and off. What? That seems crazy. I am a huge Bioware “fanboy,” but in a game where choices are suppose to matter, now you can turn off how Dark side corruption impacts your characters appearance. I would love to hear an explanation on this, besides it is a feature like a helmet you can toggle on or off. This past week with New York Comic-Con and all the information given to us from Bioware, if you missed anything…Don’t worry Corellian Run Radio has you covered! Just below we have all the top stories just a click away. 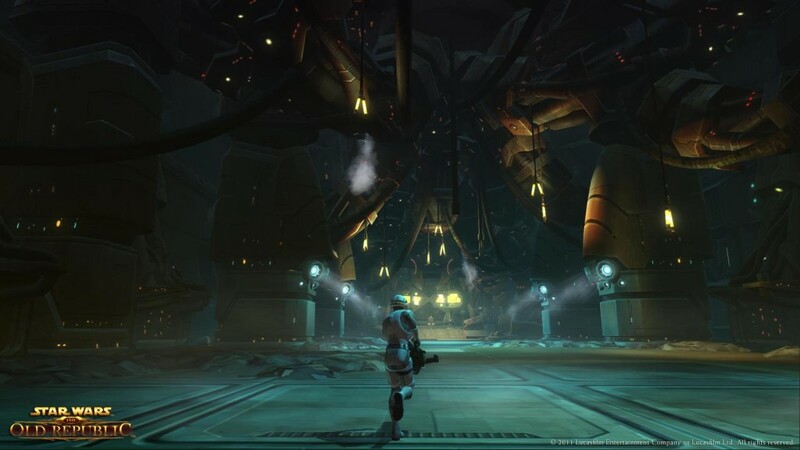 Just a reminder there is two days left to have your fan fiction submitted for the SWTOR forums fan fiction contest. Check here for more details and be sure to read and vote for these wonderful pieces of fan fiction! We also are going to take a look at another part from the ongoing fan fiction by Mandalorian Girl, Dantooine part 3. This part is another well written piece. Some of it might seem to use similar plot-lines, but I think there is more going in the story, that has been revealed. Here is just a small portion. I hope you will go check her site for this part and all the other ones, which have led up to this point. Here we see a lone Trooper charging the Command Center in the underground area of the Gormak King’s hall. That’s all this week from the HoloNet Links at Corellian Run Radio. Keep watching for new stories, with the press embargo lifted, right here at Corellian Run Radio. If you have an interesting, funny, or thought provoking Star Wars Old Republic link, please let me know via email at jason@corellianrun.com, join the CRR forums, or in the Facebook group. See you next week!